간편결제 서비스인 신한 FAN페이를 기반으로 편리한 금융 서비스와 신한 FAN 클럽 등 다양한 혜택을 한번에 누릴 수 있는 신한카드의 생활 플랫폼입니다. 신한카드가 없어도 ‘신한 FAN’을 체험해보실 수 있습니다. 단, 결제 및 신한 FAN 클럽 등의 서비스를 이용하고자 하실 경우, FAN 충전카드를 발급 받으시면 이용하실 수 있습니다. ※ FAN 충전 카드는 선불 충전카드로서 간단한 동의 절차만으로 편리하게 무료로 발급 받으실 수 있습니다. 별도의 카드 신청 없이 보유하고 있는 카드(신용/체크)를 신한 FAN 앱에 등록하기만 하면 온오프라인 가맹점에서 즉시 이용이 가능합니다. 페이, FAN 클럽, 마이, 금융, 추천, 콘텐츠, 캘린더 등의 전체 메뉴 중에서 자주 이용 하는 판만 골라 좌우 플리킹으로 넘기면서 간편하게 이용하실 수 있습니다. ※ 메뉴 관리 기능으로 원하는 메뉴를 활성 / 비활성 하실 수 있습니다. 놓치면 아까운 혜택과 금융 일정을 캘린더 메뉴에서 한눈에 확인하실 수 있습니다. 실물 카드가 없어도 온오프라인 결제 부터 제휴사 멤버쉽 까지 한번에 이용할 수 있는 복합 결제 기능과 더치페이, FAN 충전카드 기능도 신한 FAN에서 이용하실 수 있습니다. 신한금융그룹 7개 그룹사의 혜택을 마이신한포인트로 제공합니다. 카드 결제 및 그룹사에서의 거래를 통해 포인트를 적립하실 수 있고, 적립된 포인트는 온오프라인 가맹점에서 결제, 예적금/펀드/보험료 납입, 금융수수료 납부 등에 사용하실 수 있습니다. ▶ 고객님의 소중한 정보 보호를 위해 오프라인 가맹점 결제는 3G/4G/LTE 네트워크 접속시에만 가능하며, Wi-Fi 네트워크 접속시에는 PC/모바일 결제만 이용하실 수 있습니다. ▶ 신한 FAN은 안전한 서비스 제공을 위해 본인명의 스마트폰에서만 이용하실 수 있으며, 루팅/탈옥 이력이 있는 기기 및 구글 미인증 기기에서는 이용이 불가합니다. 또한 기기 변경시 구글 및 애플 계정 백업을 통한 재설치가 불가하오니 구글 Play나 애플 앱스토어에서 앱을 다시 다운로드 받아 설치 해주시기 바랍니다. 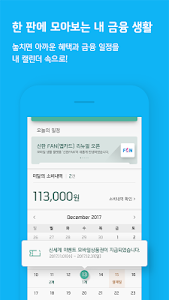 - 스마트워치 서비스는 Android 4.3 및 iOS 7.0 이상 스마트폰에서만 이용하실 수 있습니다. 신한 FAN 앱을 이용하기 위해 다음 접근 권한 허용이 필요합니다. * 위 항목은 신한FAN 앱 이용에 반드시 필요하며, 권한이 거부되면 정상적으로 작동하지 않을 수 있습니다. * 위 선택 권한은 동의하지 않아도 서비스 이용이 가능합니다. * 스마트폰 환경 설정 > 애플리케이션 > 신한 FAN > 권한 메뉴에서도 설정을 하실 수 있습니다. 신한 FAN 관련 문의 사항은 신한카드 모바일 전담 고객센터 (☎1544-9955)로 문의 주시면 친절히 안내해 드리겠습니다. 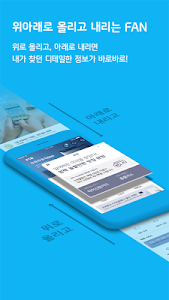 Based on Shinhan FAN Pay, a simple payment service, Shinhan Card is a life platform that can enjoy various benefits like convenient financial service and Shinhan FAN club. Even if you do not have a Shinhan card, you can experience 'Shinhan FAN'. However, if you want to use the services such as payment and Shinhan FAN Club, you can use it by getting FAN recharge card. ※ The FAN charge card is a prepaid charge card and can be issued free of charge with a simple agreement procedure. 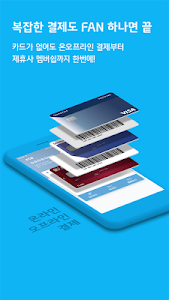 ▶ Do not issue a card. 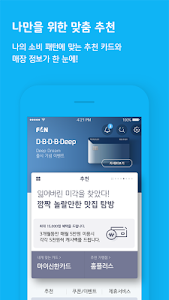 Simply register your card (credit / check) in Shinhan FAN App without having to apply for a separate card and you can use it immediately at the online and offline merchants. ※ You can activate / deactivate desired menu by menu management function. We recommend cards, merchants, coupons / events that match my consumption pattern. If you miss, you can see the benefits and financial schedules in a calendar menu at a glance. Even if you do not have a physical card, you can use the complex billing function which can be used from on-line payment to affiliate membership at once, and the function of Dutch paper and FAN charge card are also available in Shinhan FAN. You can conveniently use financial services such as short-term card loans (cash advances), long-term card loans (card loans) and general loans. 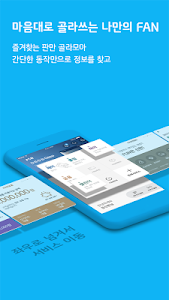 We offer the benefits of Shinhan Financial Group's seven companies as my sincere points. You can earn points through card payment and transactions at group companies. Points you earn can be used at online and offline merchants for payment, deposit / fund / premium payment, and payment of financial fees. 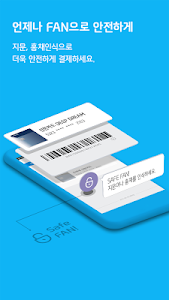 Since the card information is not stored in the smartphone but the one-time card number is used, safe payment is possible without worrying about information leakage. The card number will automatically disappear after the specified time (maximum 3 minutes) elapses after payment is made at an offline merchant with a bar code or the like. ▶ In order to protect your valuable information, offline merchant payment is available only for 3G / 4G / LTE network connection, and only PC / mobile payment for Wi-Fi network connection. ▶ Shinhan FAN is only available for smartphone users in order to provide safe service. It can not be used in devices that have a routing / jailbroken history and Google unauthenticated devices. Also, when you change the device, it is not possible to reinstall through Google and Apple account backup. Please download and install the app again from Google Play or Apple App Store. - The Smart Watch service is only available on Android 4.3 and iOS 7.0+ smartphones. * Android Wear: LG Watch, G Watch Bane, Samsung Gear, Motorola Moto 360, Sony Smart Watch 3, etc. The following access permissions are required to use the Shinhan FAN app. This is the authorization required for consultation connection, self-certification, and device certification. This permission is required to access the repository to save files needed for running your app. * The above items are necessary to use Shinhan FAN App. If the permission is denied, it may not work normally. QR code / bar code information. This right is required for use of location-based services. This right is necessary to use services such as sound wave payment. This is the right to use the calendar service. * You can use the service even if you do not agree with the above selection authority. * Settings can also be made in Smartphone Preferences> Applications> Shinhan FAN> Permission Menu. If you have any inquiries about Shinhan FAN, please contact Shinhan Card Mobile Customer Service Center (☎1544-9955) and we will kindly guide you. We will continue to provide various convenient services through continuous updates. We sincerely thank you for always using our Shinhan card.